Fact: Brisbane is one of Australia's most beautiful cities. Also, fact: we have some of the best cafés in the country, so it shouldn't be surprising that we have some of the most beautiful cafés to be found, too! With our partialtiy for single origins, our reverence of the sunshine, and our obsession with locally sourced produce, it's clear that the good people of Brisbane have taken the café culture to a new level. If you enjoy cafés that radiate character and atmosphere, read ahead for our 19 most beautiful Brisbane cafés. As a heritage listed building it shouldn’t be surprising that John Mills Himself makes the list. The walls of this subterranean hide-away are exposed brick and the highset windows filter down just the right amount of sunlight, making for a very soothing and cathartic spot to enjoy your long black. The historic feel of this building has been artfully maintained but can be easily captured for your Instagram feed. 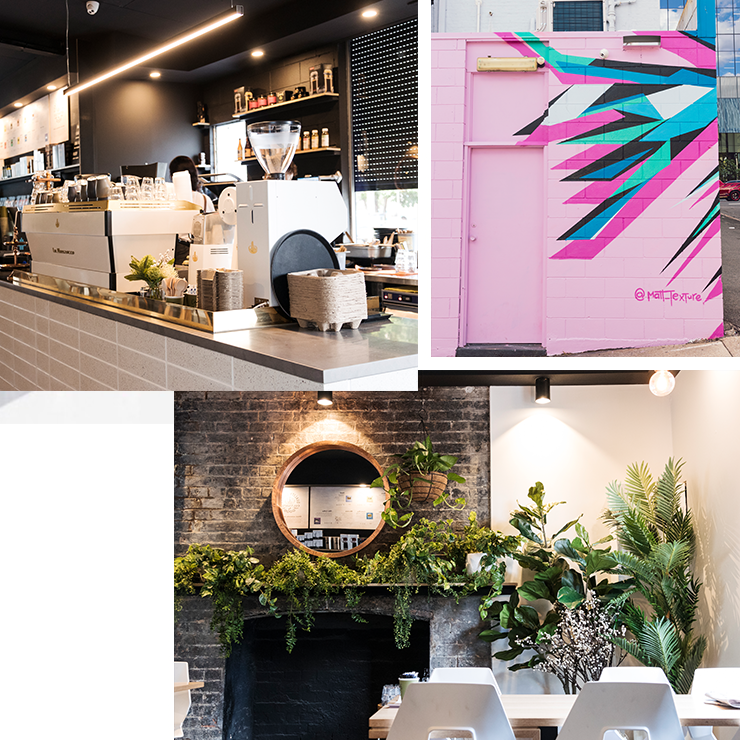 Less cute and pretty, more crisp, clean lines at CBD coffee haunt Pablo & Rusty’s, but if you’re into that whole ‘natural light’ and airy space vibe, this is the obvious spot for you. Serving up their famous roasts—these guys hail from Sydney, with a rep as some of the best roasters in the country, FYI—Pablo & Rusty’s is a perfect spot if you want great coffee and you want luxe vibes from your café. Neighbourhood Coffee Roasters is housed inside the old Rainworth General Store building, and has fortunately managed to retain all the charm and character of its predecessor. The cosy Queenslander is surprisingly roomy with plenty of nooks to relax in, but if you do want to step out for some fresh air the sweet little backyard garden is perfect for a stroll. Bedouin Brew has got to be one of the most photogenic cafés in Brisbane. Housed in a large industrial space, the café has spruced up the funky warehouse with plenty of fresh greenery. Whilst you enjoy the delicious coffee on offer (currently brewing Neighbourhood Coffee Roasters) you can peruse the plants that are all available for purchase! The frontage of Sourced Grocer is completely open, meaning as you walk up the street you get the perfect view of the grocer, the café, and the fresh greenery adorning the walls. Sunday was made for wholesome breakfasts enjoyed in the sunshine, and Sourced Grocer does it best. Plenty is another café with a ‘rustic chic’ aesthetic, and boy, does it suit them! The warehouse structure has high ceilings and plenty of space (nothing worse than a cramped café where you can hardly move around), but still manages to maintain a homey feel. You can enjoy a hearty breakfast in the sunshine, or take it indoors to check out the completely stripped back interiors. Blink-and-you’ll-miss-it, Pablo in New farm has been a face Brisbane café for years. With their tiny street frontage and oversized outdoor umbrella, pull up a spot in the shade, order one of their indulgent thick shakes and watch the world go by. Day Made Supreme is a pristine little café tucked into Woolloongabba, easily serving some of Brisbane’s best coffee. The beautiful white interiors with dark timber feels very chic and comforting, whether you’re just popping in for a java fix, enjoying some breakfast, or sticking around for the long haul. The coffee connoisseurs at Campos Coffee just love finding the ripest little coffee beans and then scoring, cupping and flavour profiling them to perfection (and we equally love the results!). There’s nothing better than wandering down to Wandoo St to sip on their delicious, feel good, fair trade coffee. Campos has funded beautiful projects from community playgrounds to helping young people in Rwanda get access to much needed open heart surgery. Absolute legends! Don’t judge the name, because we have all been there. Fresh, locally sourced eats, refreshing fruit elixirs and piping hot coffee from Morning After will quickly put those hangover toxins at bay! Combine that with stunning morning light, greenery and fresh white brickwork, and you’re quickly distracted from any morning headaches you might be nursing! With a rustic red brickwork courtyard and just a touch of lush greenery, Franky and George is the perfect dreamy inner city escape. An espresso and croissant for just $8 is a tempting peak hour treat any day of the week! Lola Coffee is your one stop shop for house made pickles and sweets! 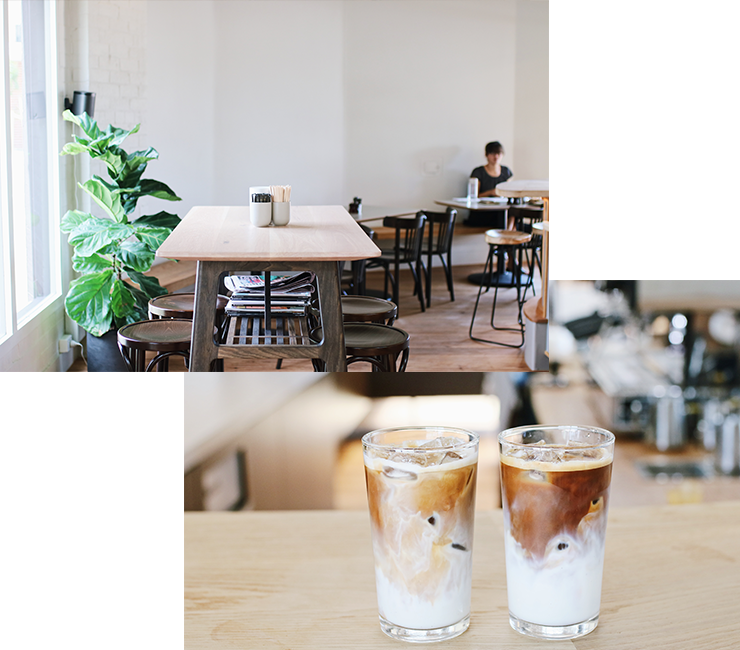 Even their affogato is served with ice-cream made from their very own cold brew! Stunning grey-scale artworks accented with bright red décor are also sure to get you inspired for the day ahead. Allpress Esspresso will lower the blood pressure of the most devout minimalists. This spacious café with open beam ceilings lays out your breakfast spread just so. It’s the perfect, expansive break out location for work from home freelances to get inspired and put their thinking hats on! 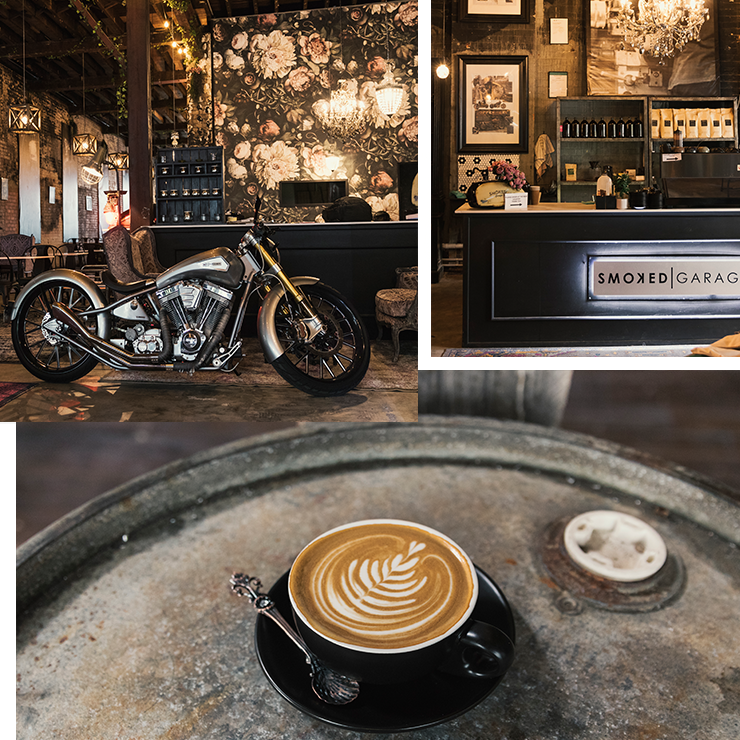 The Smoked Garage is the head turning motorbike design space and coffee shop. Sipping on espressos with the motorbikes is a tad sexier than being spotted in one of those tight bicycle suit hang outs. Picture a revived ex-warehouse with exposed brick walls, well-worn leather armchairs, custom Racers, Harleys and Commazukis. Two wheel lovers we can already hear you frothing. Our mouths start watering just thinking about the potato and blue cheese hash (really, the concept is brilliant!) Needless to say, Pourboy delivers coffee and food without compromise. Their timber furniture combined with the neon light installation is just as unexpected (yet strangely works!) as the Bolognaise-Spelt-Crust-Pie Special! Wild Canary is known for their fruit and floral drenched cakes. They are picture perfect and literally taste like you are taking a bite out of spring (as strange as it sounds, it’s true!). Everything is made from locally sourced ingredients and their botanical bistro menu is delightfully fresh and colourful. Brookfield also serves you up a countryside backdrop just over 30 minutes from the city (just be careful not to pinch a table from the locals). We spy fresh figs, pink donuts, pancakes and pork belly. The name King Arthur speaks opulence and the menu screams indulgence. You’ll catch jars of fermenting veggies stacked up on the shelves, morning light bouncing off exposed white bricks and stunning curved ceilings in this unassuming Arthur Street Coffee Shop. Drop in to this eccentric, antique filled warehouse for the best cheese and wine available in Brisbane. Also put on your dancing shoes for the Sunday Hot Club where the drinks and dance moves flow. Rich food, steamy Sunday’s and basically everything that goes down at Vieille Branche is tastefully done. The Soul Pantry just has zen vibes oozing out of it. They source only the best artisan foods and have a lush outlook onto the Grange Forest Park. Don’t just drop in for a coffee because you’re bound to get swept away by their abundance of plants for sale, terrarium workshops and garden hub. Check out The Directory for even more awesome Brisbane cafes in your hood!